The Coffee Spots that I visited on this trip to Phoenix fell neatly into two categories: places I’d been before that I wanted to write-up this time around (such as Kream | Coffee), and chance discoveries (like Maverick Coffee). 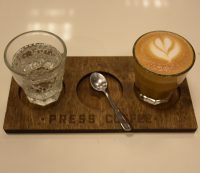 Of course, my first experience of speciality coffee in Phoenix was a chance discovery, stumbling upon Press Coffee as I wandered around the rather delightful Scottsdale Quarter on my first-ever visit to Phoenix. It’s therefore rather fitting that the subject of today’s Coffee Spot, Press Coffee Waterfront in Old Scottdale, was another chance discovery, found while looking for the bridge across the Arizona Canal, on my way to visit Cartel Coffee Lab and Berdena’s. With the familiar clean lines and white décor of the other branches of Press Coffee that I’ve visited, I felt immediately at home. The offering is also similar, with the Twitch blend, decaf and seasonal single-origin on espresso, another blend (Early Edition) and single-origin on batch-brew, plus six seasonal single-origins on pour-over through either Kalita Wave or Chemex. This is backed up by decent breakfast and lunch menus, both served until 14:30, plus a good selection of cake and a range of shakes, cold brew and iced coffees. This is the latest branch (of ten!) of Press Coffee, which opened at the end of last summer in Scottsdale Waterfront, a new development just north of the Arizona Canal. Although the address is East Camelback Road, this is Scottsdale Waterfront’s address: Press itself is on the western side, on North Marshall Way, which leads to the pedestrian bridge over the canal to Scottsdale Old Town. Press occupies a modern, utilitarian ground-floor unit which reminds me of the Scottsdale Quarter branch. The Waterfront branch is slightly wider, but not as deep, so it has roughly the same floor area, but feels bigger. There are windows at the front, set a long way back on the right, while on the left, glass double doors provide more light. However, the whole shop is under a broad, arched colonnade, which, while providing shelter/shade for the four two-person tables outside, also makes the natural light fairly subdued, even on a bright day. As a result, Press relies on multiple strip lights in the ceiling, which, coupled with a concrete floor and predominantly white counter/furniture, is a potentially harsh interior. However, it’s been saved by eight large, wooden frames which hang about a metre below the ceiling, each running the width of the store. The right-hand wall is done out in a similar wood effect, as is the bench along the left-hand wall, while the wall itself is clad in dark wood. The seating starts with the aforementioned bench, home to six, square two-person tables. Two rows of four two-person tables run widthways across Press, beyond which is a four-person bar, split by a central pillar, facing the counter at the back. Finally, an L-shaped window-bar runs along the window to the right of the door and then along the recessed window at the front, seating seven in all. The right-hand wall is home to the retail shelves and a to-go food/drink cabinet. The till, meanwhile, along with the cakes and menu are on the right of the counter, the pour-over, plus the choice of bean, are in the middle, with the espresso machine to the left of that. Finally, at the end, is where you’ll find your coffee waiting for you. When I came to order, I gave up on working my way through the six options on the brew bar, instead asking Dani, my barista, to choose for me. You should have seen her face light up: now that’s the sort of response I like! Dani’s choice was the Ethiopian Kochere Chelelektu, a washed coffee, prepared through the Chemex. I was sitting about three metres away when it was ground and was immediately hit by the gorgeous smell. In the cup, it was mellower, probably due to the Chemex, resulting in a very smooth, delicate, drinkable cup which held its own as it cooled. I paired this with the Breakfast Press Burito. Naturally, I had this for lunch, having just missed out (again) at Berdena’s. My burrito, with scrambled eggs, quinoa, avocado, kale and cheddar, was excellent and very filling. I was very taken with Press, in particularly with the outstanding, friendly baristas, so I returned the following Friday to try the Chelelektu (also on as the guest espresso) as a cortado (as previously recommended by Dani). It was every bit as good as she promised it would be, a delicate, rich, smooth coffee, served on a wooden tray with a glass of sparkling water on the side. If you enjoyed this Coffee Spot, then take a look at the rest of Phoenix’s speciality coffee scene with the Coffee Spot Guide to Phoenix. This entry was posted in Breakfast, Cafe/Roaster, Cafes, Cake, Coffee Terraces, Evening Opening, Laptop Friendly, Lunch, Phoenix, Retailers and tagged include, Press Coffee, Scottsdale, USA2019-01 by Brian Williams. Bookmark the permalink.